Dean didn’t have time to stop, and there was no room for evasive action. The Spyder struck the Ford nearly head-on, with the driver’s side of the Porsche taking the brunt of the impact. The 550 flipped before landing on its wheels in a gully. Dean, entrapped and mangled in the wreckage, was pronounced dead on arrival at a hospital in Paso Robles at 6:20 p.m. Wütherich was thrown from the car but survived critical injuries, including a broken jaw and crushed femur. Turnupseed broke his nose and suffered facial lacerations. 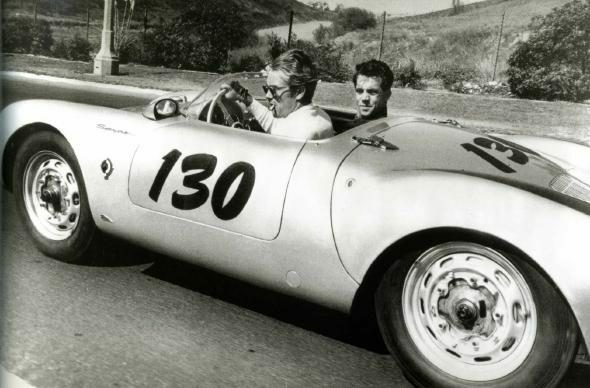 James Dean liked to drive fast, on the racetrack and off, and a few hours earlier he had failed to take Fate’s hint that he slow down, delivered in the form of a speeding ticket issued by a California Highway Patrol trooper. Speed, they say, kills, and in Dean’s case it did indeed prove deadly. Yet given how he died, many see as somewhat ironic that a month or so earlier James Dean had filmed a television spot cautioning young drivers against the perils of speeding, even more so that he ended his spiel with an admonition to eschew the practice because it might spare his life. would commence with an episode of one of those three shows, then conclude with a 10- to 15-minute segment devoted to plugging an upcoming Warner Bros. film. One of those tail-end Warner Bros. Presents featurettes was devoted to the movie Giant, then still in production. Dean’s comment proved prescient, as speeding (his own, not someone else’s) did indeed end his life. We are left to wonder what additional contributions he would have made to the big screen had he but taken his own advice. At 5:45 p.m. on 30 September 1955, film icon James Dean was killed in a car accident when his new Porsche Spyder crashed head on into another car. Brooks, Tim et al. The Complete Directory to Prime Time Network TV Shows. New York: Ballatine Books, 1999. ISBN 0-345-42923-0 (p. 1138-1139). The Stage. 15 April 1999 (p. 11). The San Diego Union-Tribune. 8 August 2000 (p. E3). Guinness, Alec. Blessings in Disguise. New York: Warner Books, 1985. ISBN 0-446-38426-7 (pp. 34-35). Lerner, PReston and Matt Stone. History’s Greatest Automotive Mysteries. Minneapolis: Motorbooks, 2012. ISBN 978-0-7603-4260-2 (pp. 184-185). Read, Piers Paul. Alec Guinness: The Authorized Biography. New York: Simon & Schuster, 2003. ISBN 0-7432-4498-2 (pp. 262-263). The Daily News of Los Angeles. 30 September 2001 (p. T1).